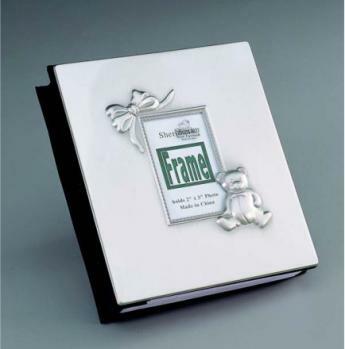 Our elegant baby album features a non-tarnish brushed pewter finish. The front cover holds a 2" x 3" photo and features bow and teddy bear icons with a beaded design framing the 2" x 3" photo. Overall album measures 5.75"W x 6.5"L and holds 100 4" x 6" photos. Album binding is covered with soft, navy velvet.